Our Customer Service Team are available live, everyday. As part of our standard compliance regulations, PowerPlay is required to ensure that all clients have valid proof of identification and residency on file. We complete the verification process by validating your account information such as your name, address, date of birth, and other details. Depending on your chosen method of deposit, you might also be requested to provide supporting documentation. All documents can be emailed to support@powerplay.com. What should I do if my account is restricted due to missing documents? If your account is suspended due to missing documents, you can still submit your documents for verification to support@powerplay.com or contact customer support for further assistance. What documents do I have to send to verify my account and how can I do it? Depending on your chosen method of deposit, you might also be requested to provide supporting documentation. In what file format can I send the required verification documents? All submitted documents will be stored on a secure file server using industry-standard strong encryption. The encrypted files are only accessible by authorized personnel in the relevant department using a specially designed and secured access mechanism. Why do I need to verify my Credit Cards? The main reason Credit/Debit card information is requested is to protect the cardholder and PowerPlay from fraudulent transactions. The information is used only to verify the data provided during the transaction. How do I verify my Credit Cards? What will happen if my Credit Card is not verified? If your Credit Cards are not verified, you will not be allowed to make any withdrawals (with any payment method). Front of your Credit/Debit Card (please cover the middle digits only showing the first 6 and last 4). Please note if the middle digits are showing the attachment will be rejected. All documents must be emailed to support@powerplay.com or you may contact our customer support department for further assistance. What is the maximum size I can email per file? What should I do if I am unable to send my documents through email? You can either start a “live chat” session, by clicking on the chat button on www.powerplay.com or send an email to support@powerplay.com with your request. What information do I have to include if I am reporting an issue regarding the email? You must be at least eighteen (18) years old to open an account and play at PowerPlay. There are absolutely no exceptions to this rule. We reserve the right to request proof of age, perform checks to verify any information provided and refuse any application without further correspondence. Each customer is allowed only one account. Duplicate accounts in the same name are not permitted and will be suspended. By opening an account at PowerPlay you will automatically gain access to the Internet’s leading online sportsbook and award-winning casino without the need to register again. 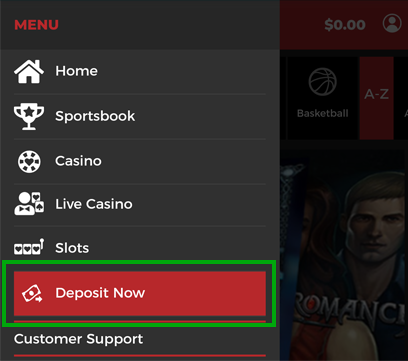 All funds credited to your account will be held in a single, virtual wallet which you can use anywhere within our casino and sportsbook. Your email address will be your Client ID and your password will be of your own composition. When you complete the registration form you will automatically be logged into your account. If you have misplaced, or cannot remember your PowerPlay account password, please select the "Forgot Password?" option on the site. This option is located on the Main page. First, confirm your email address and then your Security Question answer. For your security, a new temporary password is created for your account. The temporary password is emailed to your registered email address. It may take up to 30 minutes to receive your temporary password email. If you do not receive the temporary password in your inbox, please check the “Spam” and “Trash” or “Junk” folders. Once you have your temporary password, please return to the site and use your email address and temporary password to create a new, permanent password. Be within 8 to 10 characters long. contain at least one special character (e.g.! @#$%^&*() _) but no spaces. If your current password is greater than 10 characters, please only enter the first 10 characters when prompted to enter your 'Current Password". When you enter your password, our security is also case sensitive, so please make sure you remember the case of each letter in your new password. How do I change my registered account address? To change your registered address or country of residence, you will need to go through our verification process. For a change of country of residence, please make sure to check our list of restricted countries in our Terms & Conditions. Evidence of identity must include your full name, residential address and date of birth. All documents must have been issued within the last three months and must show your name and address as they appear in your registered account. Please note: Customer emails are stored on a cloud, we do not store any of our customers' personal details in this cloud. We recommend that you send all personal documents via the methods specified in this email. Please send any questions to support@powerplay.com regarding this request. Once approved, you will receive an email as confirmation. The “Account details” allow clients to independently update their phone number, security question and password. We recommend all clients use this feature to confirm their current account information and make changes, as necessary. To use the feature, log into your account and select the My Account menu option and Account Details. You may change some or all the listed information by "clicking" the appropriate box(s) and then selecting "Edit Details". Edit your account details as required and select "Update Details". For changes in your registered email address please email us from the email address registered to your player account. Can I turn off or edit the “Self-Exclusion” Feature? For additional security, the period used for this feature is not published. This feature is required by our licensing authorities and we are unable to adjust the functionality. To change the registered email address of your account, please contact our Customer Support Center (support@powerplay.com) using the email address currently registered to your Powerplay account. If you did not receive the Activation Link in your inbox, please check the “Spam”, “Trash” or “Junk” folders. If you did not receive the Activation Link in your inbox, and you have not found it in the “Spam”, “Trash” or “Junk” folders, please click here to request a new Activation Link. Please make sure that you entered your email address correctly. If you think you might have misspelled your email address, please contact us. If the activation link has expired, please click here to request a new activation link. Enter your email address and date of birth and you will receive a new activation link. The link expires 3 days from the time it was requested. There are several reasons that you may be having trouble logging into your account. If you have a newly created account, you will need to activate your account by clicking on the activation link that was sent to the email address registered upon sign up. Please check your inbox. If you did not receive the activation link, please click here to request a new Activation Link. If you have made multiple unsuccessful attempts to log in to your account, it may be suspended for your protection. Please contact our Customer Support Department to get instructions on how to unblock your account. Your account may have been suspended because we need further documentation on your account to fulfill our Regulatory and International Financial Regulations. This is a standard procedure, please check the inbox of your registered email address, as you should have received an email with further instructions. Once the required documentation has been submitted and approved, your account will be reopened. If you suspect that you may be experiencing a technical issue with your login attempts, please take a screenshot of the error (whenever possible making sure that the error message and the URL is clearly visible in the screenshot) use the contact us/live chat feature on the website and we will be able to assist you individually. As there are several reasons an account may be suspended, we can only outline the most common reasons a customer would have an issue logging in. Please check the inbox of your registered email address, as you should have received an email with any additional details. If you are still unable to log in to your registered PowerPlay account, please contact us and we will be able to assist you with this issue. By clicking on: “My Account” and selecting one of the menu options. There are a variety of reports available to review, both; wagering and non-wagering transactions. Click here to make transfers into your PowerPlay account. Choose the amount you wish to deposit and the payment method of your preference. EcoPayz: This payment solutions provider offers instant, safe and convenient payment services to customers and businesses across the globe. 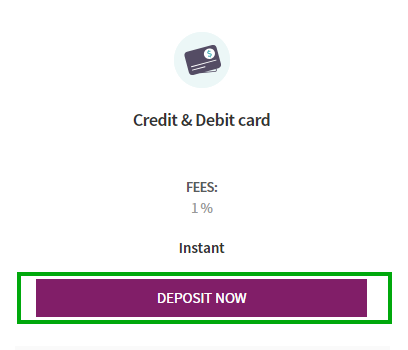 Please register into EcoPayz to make your deposit: https://www.ecopayz.com/en/help-support. Click here and follow the easy steps on how to make your withdrawal. Please note: All withdrawal amounts will be refunded back to the originating account. To review your pending and graded bets, please use the options “Open bets” displayed in the screen once you access your account. 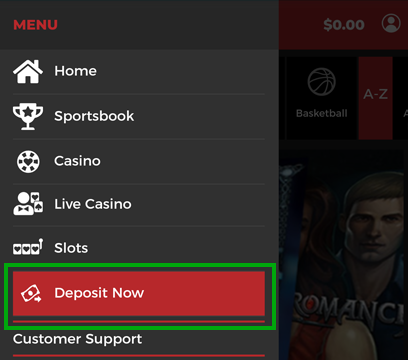 You may access the complete Review Account section by clicking on your “My Sports Account” or the “My Casino Account” menu option. “Cash Out”: These are bets that are eligible for cash out. “Open bets”: These are your pending bets. “Bet History”: History of all your placed bets. “Free Bets”: balance of the free bets and vouchers granted to our customers. If you believe there is an error in your account, please contact our Customer Support Department with: your email address, the details showing on the “Open Bet” or “Bet History” page: the DESCRIPTION of the bet, the ID# of the bet and the Date/Time when it was placed. To close or suspend your player account, please contact us with specific details and we will be more than happy to comply with your request. All requests to have accounts re-opened or unrestricted are reviewed for eligibility and shall be done after a cooling-off period of seven days following your request. We realize that for some Customers gambling might become a serious problem and for such Customers we offer a self-exclusion option for a period from six months up to permanent exclusion, as per a Customer's request. If you wish to self-exclude, please contact Customer Supports specifying the period you wish to be self-excluded for. If you choose to contact Customer Supports, kindly note that it may take up to 24 hours to process your request. PowerPlay gives you the option to place limits on the amount you would like to risk or lose and even Deposit. Go to “My Account” and click on: “GAMBLING CONTROLS”, several options will appear; here you can create the limitations you desire. 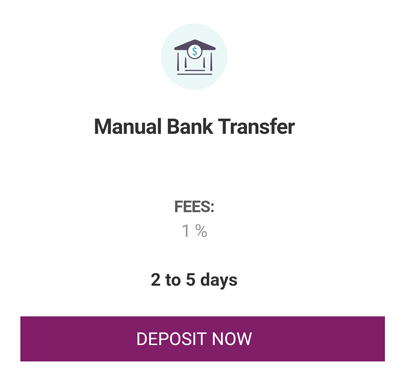 This feature gives you possibility to set a limit to what amount you allow yourself to deposit into your account and over what period; daily, weekly or monthly. If you would like to limit the amount you can risk or lose for a set period. This option is to remind you how long you have been/are playing casino games. For instance, if you set my Reality Check to 5 minutes, you will receive a pop-up message every 5 minutes. In addition, you will be disconnected from the game and you will need to access the games again if you want to continue playing. After not using the account for any period, the account will remain accessible for the customer should he/she wish to return. Customers may submit a formal complaint by forwarding an email or submitting a ticket via the Contact us page on the site using their registered email address. Customers must provide as much details as possible including the email address associated with the account, date, time and all available details relevant to the issue. Customer Support will review the issue to determine adherence to our Terms and Conditions or Policy rules. What are the best payment methods for Canadian users? The Vanilla Prepaid Card is one of the most successful ways to use a Bank Card on PowerPlay. Just pick one up from over 10,000 retail locations across Canada. Once you have your Vanilla Prepaid Card you can deposit funds by clicking the Mastercard logo under Payment Methods. To find out more and where to buy your Vanilla Prepaid Card click here. Need a card the you can top-up online? Then try the Vanilla Reloadable Card. To find out more about Vanilla Reloadable Card click here. EcoPayz is a well known international payment wallet which allows you many ways to make deposits into your EcoPayz Wallet and instantly use these funds to play on PowerPlay. You can open an account at www.ecopayz.com and quickly deposit funds using your bank card, direct bank transfer (in branch and online e.g. via Interac), electronic transfer (recommended) and many more. EcoPayz is fast and effective, particularly in Brazil and Canada. Please note that EcoPayz can't be used for gaming in Guatemala. There are several potential reasons for your card being rejected. 1. Your card is registered to a bank in the United States. The USA is a restricted territory for gaming and as such USA banks will often not allow credit card transactions with gaming websites. Your financial institution, as a precautionary action, may put a block on your card. To check if this is the case please call your bank and request that your card can be unblocked. We suggest you deposit via a credit or debit card that is not issued by a US bank. 3. You have entered your security details incorrectly. Please double check and if you continue to have issues please contact your bank. 4. You have entered your card details incorrectly. Please double check your details and try again. 5. You have insufficient funds. Please login or contact your bank to check your balance. In the mean-time, please feel free to use an alternative credit or debit card for your deposits or sign-up with one of our globally recognized e-wallet options. If you have questions, would like assistance or more information, please contact support@powerplay.com at any time. We are here to answer your questions and provide any assistance you may require. We look forward to seeing you back on PowerPlay soon. 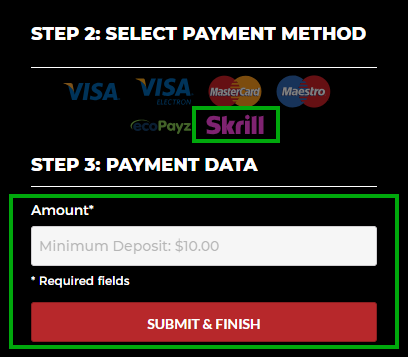 How do I open a Skrill account? 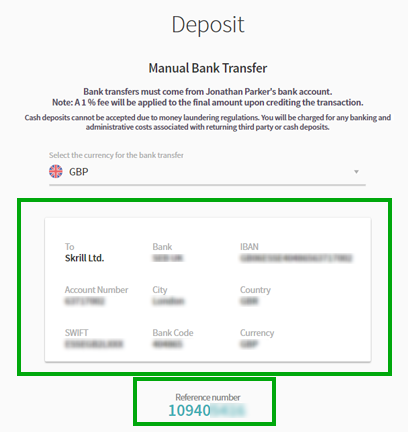 Opening a Skrill account is easy. 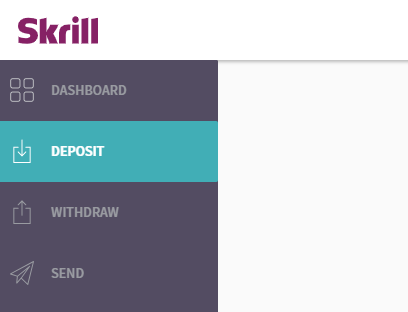 It enables you to quickly deposit funds into your Skrill Wallet via Banks Cards or Bank Transfer and use those funds on various websites including PowerPlay. Please note that Skrill won’t work if you live in or are currently located in Barbados. Login to PowerPlay and click ‘Deposit Now’. On desktop computers ‘Deposit’ can be found top right of the screen. Choose Skrill from the Payment Methods, add the amount you’d like to deposit and click ‘Submit & Finish’. You’ll be prompted to login or to Sign Up. Do not try to login. Click ‘Sign Up’ at the bottom of this page. Complete the form. We recommend you use the same email address as used to sign in to PowerPlay. Once complete, click ‘Create Account’. Please be sure to remember your login details. Please note at this point you have not deposited funds into your account. You can do this via your Bank Card or by making a Bank Transfer. Please click on the appropriate FAQ to find out how to complete this process. 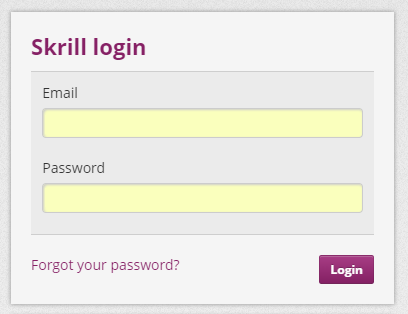 Login to Skrill on www.Skrill.com. Click Deposit on the left hand menu. Click ‘Deposit Now’ on the Credit & Debit card panel. 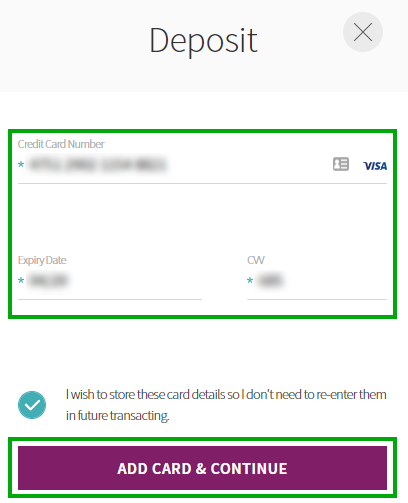 Enter your card details and tick the box to store them in Skrill. Then click ‘Add Card & Continue’. 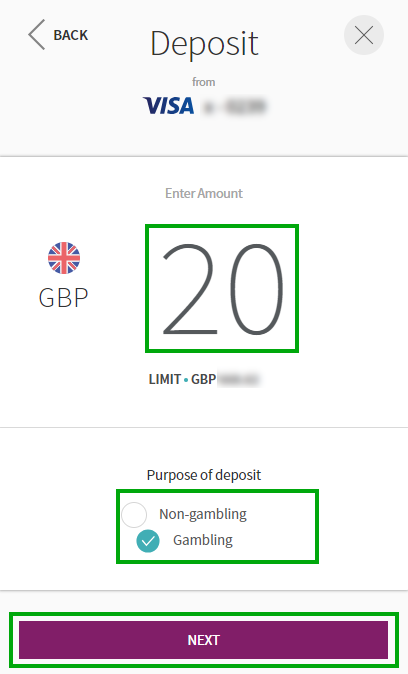 Enter the amount you wish to deposit then select the tick box for ‘Gambling’ and hit next. Your Skrill balance will be updated. Login to Powerplay, click ‘Deposit Now’. Choose Skrill from the Payment Methods, add the amount you’d like to deposit and click ‘Submit & Finish’. Note that the amount should not exceed the level of funds in your Skrill wallet. In the Skrill panel, login to your Skrill account and the funds will be transferred from Skrill to your PowerPlay account. 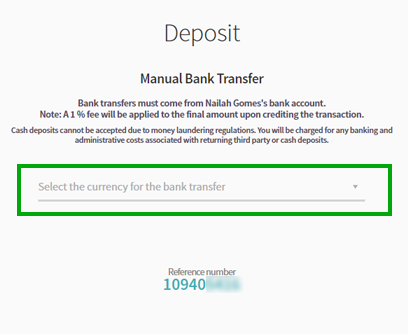 Click ‘Deposit Now’ on the Manual Bank Transfer panel. Choose a currency. it doesn’t matter if your local currency is not displayed. Your chosen currency will be exchanged to US Dollars for use on PowerPlay. Take note of the bank details and importantly the Reference Number - you will need these to make the online bank transfer. In a new browser tab, login to your personal online banking and use the details from Step 5 to set up Skrill as a new payee and to transfer funds into your Skrill wallet. Take care to use the Reference Number that was displayed in Skrill displayed. Alternatively, you can take these transaction details to your local bank and make the transfer in person. Please note there may be a delay before your funds reach your Skrill account. 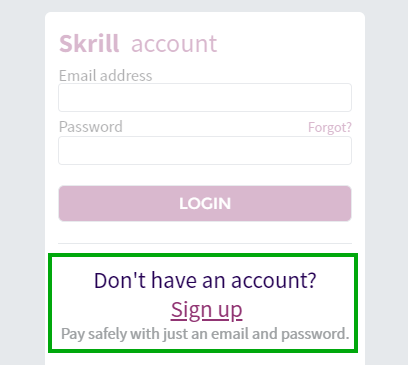 You can login to Skrill directly to see when your updated balance becomes available. Once your funds are successfully transferred to Skrill you can continue to Step 7. When I withdraw, what to the Withdrawal States mean? Complete: The money has been sent to you and will arrive in 3-5 business days. Authorised: Your request has passed the first step of the withdrawal process, we are still processing it, you will need to wait for the status to move to Complete. This will happen within 48 hours. Cancel: You may cancel a withdrawal request by clicking the Cancel button. Cancelled: You or PowerPlay has cancelled the withdrawal request. Declined: This withdrawal would have been declined by PowerPlay, the reason for this can vary and would have to be looked into on a case by case basis. Please try to withdraw again or contact Customer Support. The "Double" is a bet where two (2) selections are made and if the first wins, everything that would have been returned is then used as stake for second. This style of bet is popular because it creates the potential for larger returns but at the expense of increased risk as all it takes is one losing selection for the bet to return nothing. Similar to the "treble" and "accumulator" the only difference being a lower number of selections. "Each way" and "to-place only" options are also available at some bookmakers. Popular in all sports especially football and horse racing, all bets in a "double" must be on separate events. A "Treble" is a multiple bet consisting of three selections, all of which must win to gain a return. The treble is a bet where three selections are made and the returns from the first are rolled over to the second, then the returns from the second rolled over to the third. Larger returns can be achieved using this bet at the expense of increased risk as all it takes is one losing selection for the bet to return nothing. Similar to the accumulator and double, only varying in their number of selections, a double having 2 and an accumulator having 4 or more. Popular in all sports especially horse racing, all bets in a treble must be on separate events. An "Accumulator" or "Acca" is a bet that combines four or more selections into a single wager that gains a return only when all parts win. The advantage of an accumulator is that winnings are much higher at the expense of increased risk, only a single selection need lose for the entire bet to lose. In the case of a non-runner, returns are calculated as though the accumulator hadn't contained the selection i.e. a six-fold would become a five-fold. Dead heats for a winning position are settled at reduced odds using standard rules. Selections from the same event cannot be combined into a single accumulator, this is to prevent anyone trying to place several bets on the same runner. More formally the selections must be mutually independent. The "Yankee" is a 4 selection wager consisting of 11 bets: 6 doubles, 4 trebles and a four-fold accumulator. The yankee is rumored to be named after an American soldier that placed a small bet in the UK and due to the multiple roll-over mechanics at work won back hundreds of thousands. This is a full cover bet where each selection appears in 3 doubles, 3 trebles and the four-fold accumulator. To understand how winnings change with outcome, stake size and odds most people prefer to use a yankee calculator, both before placing a bet and after the outcomes are known. Two or more winning choices guarantees a return from this wager. The "Goliath" is an 8 selection wager consisting of 247 bets: 28 doubles, 56 trebles, 70 four-folds, 56 five-folds, 28 six-folds, 8 seven-folds and an eight-fold accumulator. Named after the huge number of bets that together make this wager, the goliath is one of the largest bets available and is best left to experienced punters. Only trumped by the goliath flag is terms of size this multiple bet has the potential to generate huge winnings if you have enough stake to fund all bets. All selections have an equal weight on the return so it doesn't matter which order they are added to the betting slip. Working out winnings for this kind of bet would be impossible by hand so use a goliath bet calculator to save time. Such a calculator can also be helpful in understanding how one or two losing runners affects returns. When 2 selections win, a return is guaranteed. A €1/$1 Goliath bet costs €247/$247. Betting on the 'Scorecast' is a single bet on who'll be the first goalscorer of the match and what the correct score will be. If your selected player doesn't take part in the game your bet will be settled as a single on the correct score of the game. If your selected player comes on after the first goal is scored, then your bet will be settled as a single on the correct score. Just like normal first goalscorer bets, own goals don't count so your scorecast bet will carry on to the Next Goalscorer. If the match ends 1-0 and the only goal was an own goal, then bets are settled as a Correct Score single. Should your Scorecast bet be on a player to score at any point during the 90 minutes, then that part of the bet will be settled as per our ‘To Score in 90 mins' rules. Should the player take no part at all then the bet will be settled as a correct score single. An accumulator / Acca is a bet that combines four or more selections into a single wager that gains a return only when all parts win. The advantage of an accumulator is that winnings are much higher at the expense of increased risk, only a single selection need lose for the entire bet to lose. In the case of a non-runner, returns are calculated as though the accumulator hadn't contained the selection i.e. a six-fold would become a five-fold. Dead heats for a winning position are settled at reduced odds using standard rules. Selections from the same event cannot be combined into a single accumulator, this is to prevent anyone trying to place several bets on the same runner. More formally the selections must be mutually independent.